***Note: To downloads Holiday Screensavers from this page, please click on the screen shot of interest. 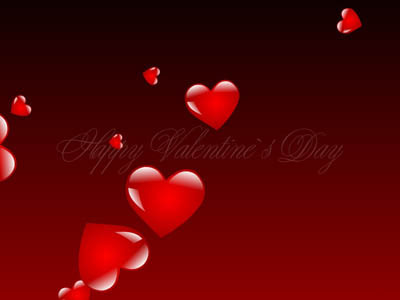 Valentine`s Day - a holiday that is marked by many people around the world on February 14. People believe that Valentine`s Day has been around for more than 16 centuries. As usual people give to loved ones flowers, candy, toys, balloons and special cards - valentine. We offer you an unusual way to declare your love - great screensaver! Install this screensaver to your computer for your love. Your sweetheart will appreciate your attention! It is so easy! 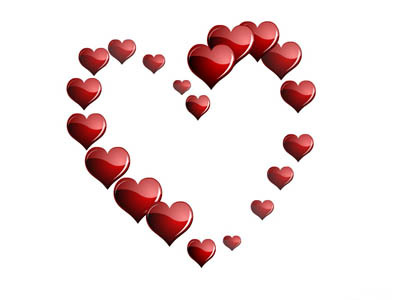 We offer you a high quality animated Valentine screensaver in the form of hearts. If you want an original and funny screensaver - then it is created specially for you! In addition, you can make a pleasant surprise for a loved one, just download and install this screensaver! Free holiday screensaver is suitable for any Windows and takes up minimal space on your PC. All people are looking forward to the onset of the Christmas holidays. By decorating their homes inside and outside with all the necessary attributes - ribbons, toys, colored lights, garlands and fir branches. Christmas will come to you at any time of year, even in summer, when you download this wonderful screensaver and decorate it to your computer monitor. Our new animated holiday screensaver consists of four stages, gradually changing each other to the accompaniment of great Christmas melodies. 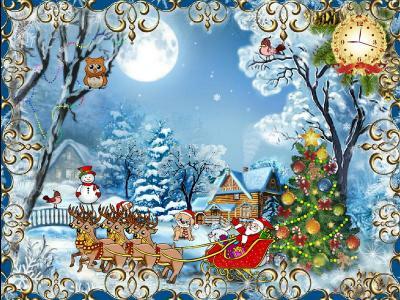 Christmas Fantasy holiday screensaver gives you an ultimate chance to watch Santa Claus, Snowmen and lots of funny animals hastily making arrangements for Christmas celebration. Free holiday screensaver takes you on a wonderful journey to the magic woodland. It will help you to experience the magic and charm of this wonderful holiday! Christmas is the most important holiday of the year. Children and their parents are awaiting this holiday and make wishes or just want to believe in the fairy tale. 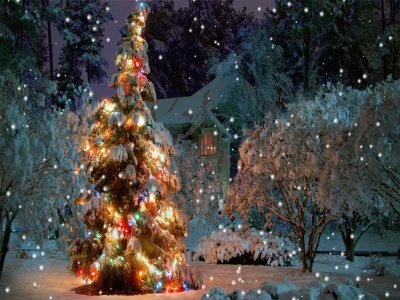 Christmas tree - the most important attribute of this holiday, it is impossible to imagine it without Christmas and New Year. We offer you our new screensaver Christmas Tree! The large stately spruce in the picturesque winter forest will adorn your desktop. Download it now absolutely free! Christmas and New Year once again knocking at our doors, windows and hearts. Let it come in! Colorful screensaver "Christmas Suite" is designed in the style of the animated holiday cards. It will bring warm atmosphere of our favorite holidays to you home. Such kind of animation, no doubt, will be loved not only by you but also your children. Santa Claus in sleigh reindeer, decorated Christmas tree, funny characters forest, birds in the forest glade and Snowman with children. Christmas tinsel will decorate your computer desktop and will bring you a good holiday mood. 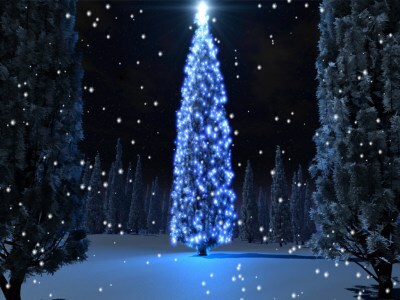 Screensaver is accompanied by beautiful Christmas music and decorated with analog clock in the New Year setting. Merry Christmas and Happy New Year! Christmas is a favorite holiday of everyone! Before Christmas we carefully and lovingly decorate our homes. In accordance with the ancient tradition of decorating the Christmas tree and put fun toys on it. This tree presents a critical holiday atmosphere and foreboding magic. We decorate our homes, why not decorate and our computer? We offer you a new colorful screensaver for Christmas. Free holiday screensaver with a very high-quality graphics. Christmas tree, glittering garlands of lights, in snowy woods amid a cozy winter cabin. Very kind of screensaver that will create a sense of celebration! Free to download and simple to install! Christmas and New Year once again knocking at our doors, so hurry up to open them! Otherwise you may miss out your gift. 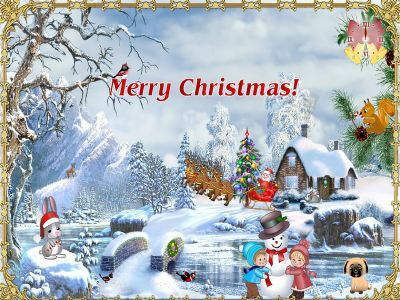 A colorful animated screensaver Christmas Cards will decorate your desktop and bring the atmosphere of our favorite holidays to your home. 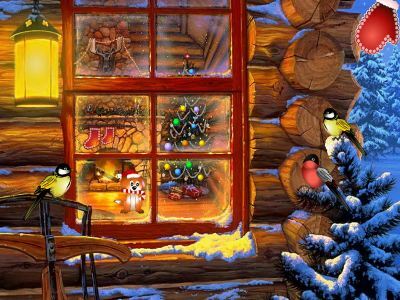 Here you will find Santa s reindeer and the Snowman, amusing forest and holiday characters, a Christmas tree with Christmas ornaments, birds in a forest glade. Screensaver is accompanied by a recognizable Christmas melodies. Analog clock is decorated with framed by spruce limbs. Give a Christmas card to friends and family and let them to be happy with you. Merry Christmas and Happy New Year! If you are a "Free Holiday Screensavers" creator and would like to have your work listed on DesktopLand.com then please submit your work for us to review and list. Friends and Free Holiday Screensavers Developers - Welcome!